Jamieson, a rural township and agricultural district, is at the junction of the Goulburn and Jamieson Rivers, in country with river flats. It is 30 km from Mansfield and 120 km north-east of Melbourne. 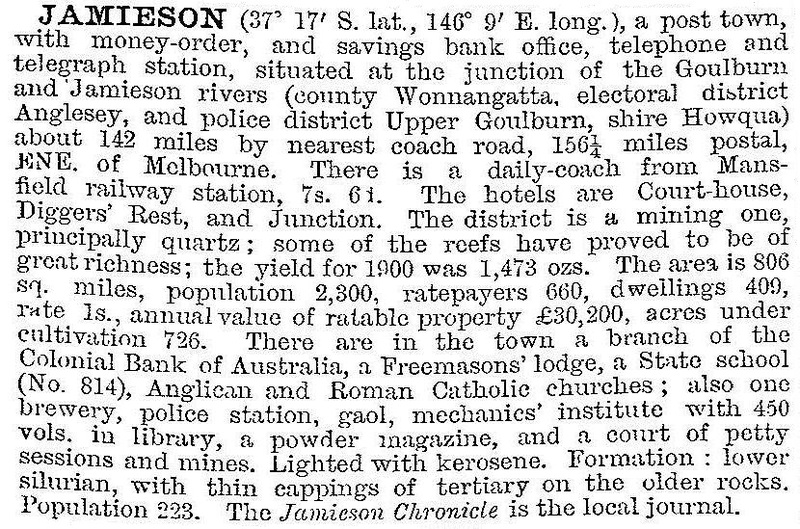 Jamieson was a goldfield and a supply centre for gold fields in a belt of country running southwards to Walhalla. Prospectors reached the area in 1860, and in 1861 the Jamieson gold workings had over 300 people. A town site was surveyed in 1862 on the river flat encircled on three sides by the Jamieson River. It was probably named after a shepherd, George Jamieson, who grazed sheep there during the previous decade, although a squatter William Kerr, West Gippsland, has been suggested as having inspired the name. By 1865 Jamieson had a borough council (1864), a Catholic chapel, an Anglican church, a school, a court house and police camp, branches of two banks and two insurance offices, five hotels and several stores. Balliere's Victorian gazetteer described it as the entrepot to the Woods Point and other diggings. In 1865 the first Jamieson and Upper Goulburn race meeting was held. The 1870s were golden years for Jamieson, but the following decade saw a sharp decline in gold production. Howqua shire superseded the borough in 1874, extending municipal government to Gaffneys Creek, 20 km southwards, and to the intervening small settlements of Kevington, Ten Mile and Knockwood. The shire offices, however, were in Jamieson. Gold production continued fitfully until the first decade of the twentieth century, and yielded increasingly meagre returns until many mine workings were destroyed in the 1939 Ash Friday bushfires. Howqua shire was united with Mansfield shire in 1919. Since the development of tourism in the Lake Eildon region, Jamieson has gained from providing rural-retreat and motoring holidays. It has two hotel/motels – the Court House and the Junction – a caravan park and several restaurants/bed-and-breakfasts. Sawmilling has also assisted the local economy, and farming extends about 7 km eastwards along the valley of the Jamieson River. Fishing in the streams has a strong following. Amateur gold dredging in the Jamieson River has occurred since the 1980s. Grey and Perkins Streets include several of Jamieson’s historic buildings, including the post office (1872), the shire hall (1883) and the Catholic church (c1900). The Jamieson court house (1863) is on the Victorian Heritage Register. At the 2011 census, accommodation and hospitality accounted for 19% of employment and mining 6.3%. The median age of residents was 57 years at the 2011 census. The school’s enrolments have been 18 (2011) and 11 (2014).